Our May 2nd "High Fun Dry Run"
At the Cowboy Church. Bring BB Guns, BB's, and eye protection, Lunch provided. God is Good and He has been blessing the Gateway to the High Country Cowboy Church mightily! Bring your family and friends to our New Sunday Morning Worship Services. (We also are still having our evening services at 7 PM on Mondays.) We are just 20 minutes north of Columbia, MO and just 12 minutes south of Moberly, MO. Bring a dish, if you can, on Monday evenings (or on the first Sunday of each month) of something to share for our Fellowship Meals after the worship service. The worship Service begins 7 pm, then our Fellowship time with cowboy goodies begins about 8 pm. 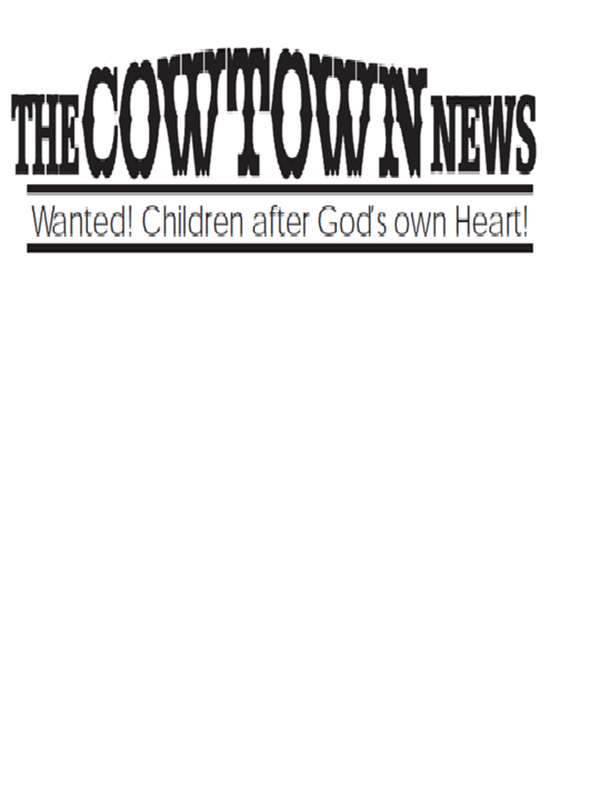 The Cowtown Series: Wanted! Children’s Bible Study will focus on learning about David and Saul based on the stories found in Samuel. The lessons will address the troubles David experienced because of Saul’s jealousy, and will highlight the virtues God looks for in children after his own heart as David was. The curriculum was designed by Barry McWilliams in 1999. I have sent a request to use the curriculum as he has indicated- it is not copyrighted. Lessons have been accessed from the following website: http://www.creativebiblestudy.com/vacationbibleschool.html. Led by: I plan to lead each of the lessons with the assistance of a volunteer for the night of the lessons. I have requested a copy of my Criminal Background Check through the Missouri State Highway Patrol for record purposes. Whomever volunteers would also need to provide criminal background documentation. I will continue to develop the activities and keep track of readings from the Trailboss’ Strongbox. Life is not easy and we often find ourselves in troublesome situations where we have to make difficult decisions. The Cowtown Series will focus on difficult times in David’s life and how his character was after God’s own heart. Lessons will highlight similar situations children may find themselves in and discuss the good or bad of these character traits. There is an emphasis in these situations on dealing with “showdowns” –confrontations- as God would have us do. “Saul” will be used as an example from each Buckaroo’s life as a bully or unfaithful friend representing peer pressure. The story of David and Saul will provide an illustration for the many sins of this Earthly life. The lessons will provide reference to how confrontations can lead to situations in which we are tempted to flee, fight back, join in or respond in a kind manner. David presents us with godly responses to trouble through courage, a trust in the LORD and mercy towards his foes. The focus of the Cowtown Series will be based on David during the time he was an Outlaw in the wilderness. The lessons will focus on contrasting David and Saul; and on doing the rights things in trouble and bad situations. The children will learn about the various stories of David and Saul portrayed throughout the lessons, participate in activities and conduct a performance of their lessons in a melodrama tentatively set for late April, 2014. 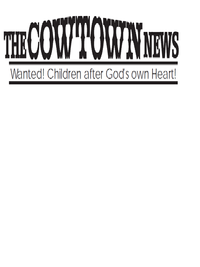 Each month they will receive a monthly edition of the Cowtown News that deals with each month’s lessons. Children will meet within sight of the congregation during Pastor Dale’s message. Children will return just prior to the closing prayer and Ten Gallon Hat’s last song. Readings will be collected after each night’s service. Theme: David’s uncertainties and trusting of God while fleeing Saul. Theme: Vengeance and Mercy – as David spares Saul’s life twice. Theme: David’s discouragement and God’s deliverance as the Story ends. -The LORD is close to the brokenhearted and saves those who are crushed in spirit. –Psalm 34:18.